Butter-braised spring carrots are a simple yet flavorful side dish. 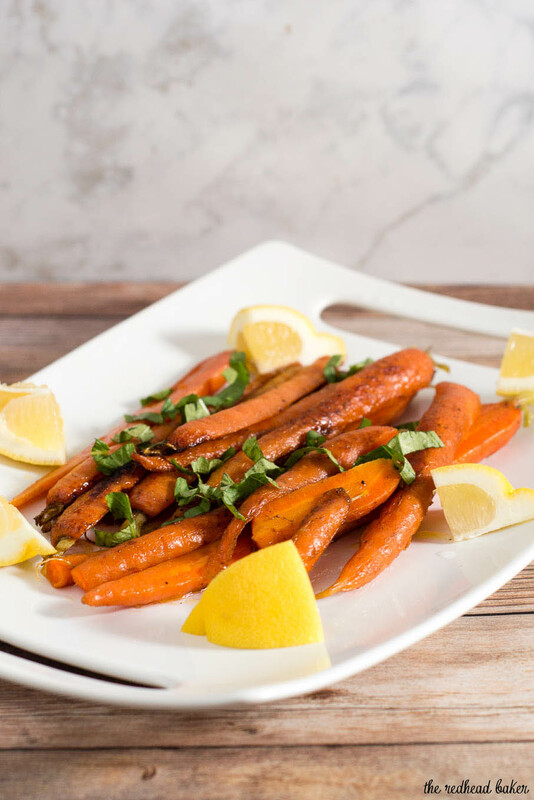 A garnish of fresh basil complements the sweeter carrots perfectly. Sometimes, the simpler things are, the better they are. This recipe has just six ingredients. It’s easy enough to serve on a busy weeknight, but delicious enough to serve at a holiday meal. The recipe stars spring carrots, which are smaller and sweeter than regular carrots. 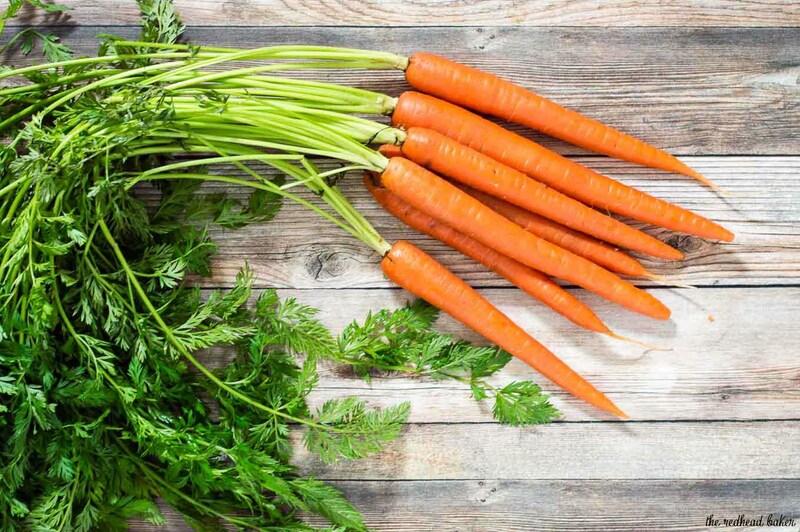 In grocery stores, they are often sold in bunches wrapped with a rubber band, with their green tops still attached, rather than trimmed and bagged like regular carrots. If you have a local farmer’s market, check there, too. They might even have rainbow carrots, which can be used in this recipe as well. I’ve been making this recipe for a while and meant to share it with you last year. I made the recipe, took pictures … and the pictures disappeared into thin air. I resolved to share it this spring instead, and continued to experiment with the recipe: with lemon or without? With tarragon (pretty tasty)? With mint (not a fan)? With basil (YUM!)? Not only do these carrots cook quickly, they’re also pretty hands-off. Drop into the melted butter, turn once or twice during cooking. That’s all. You don’t want to turn them too often. You WANT the carrots to caramelize as they sit in the butter. Those bits are my favorite. 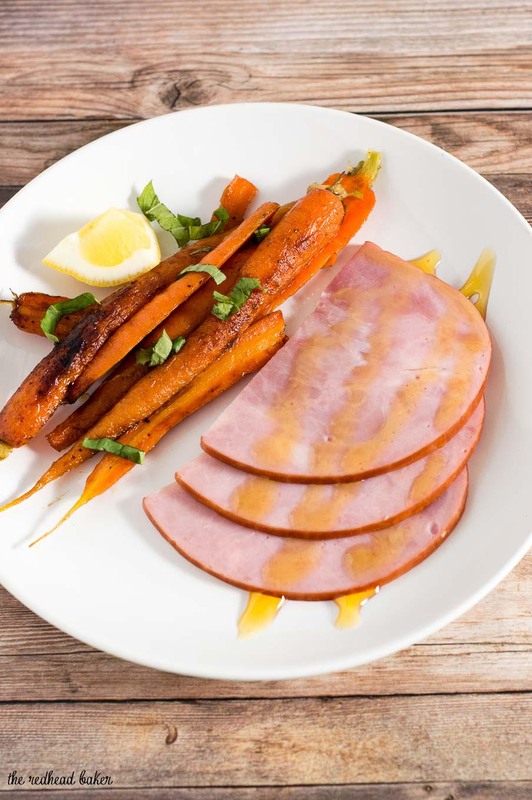 I’ve served these carrots alongside ham, chicken, and salmon, but I imagine they’d go well with any kind of protein. It’s very easy to scale this recipe up or down, depending on how many people you need to serve. But I recommend making more than you think you’ll need, because you’ll be going back for a second helping of these delicious carrots! Scrub the carrots, but do not peel. Cut off all but half an inch of the leafy tops. Halve the carrots lengthwise. Melt the butter in a large, deep Dutch oven over medium heat. Once melted, add the carrots and salt, and toss to coat the carrots in butter. Cover, and cook on medium heat for 15 to 20 minutes, occasionally tossing the carrots in the butter. 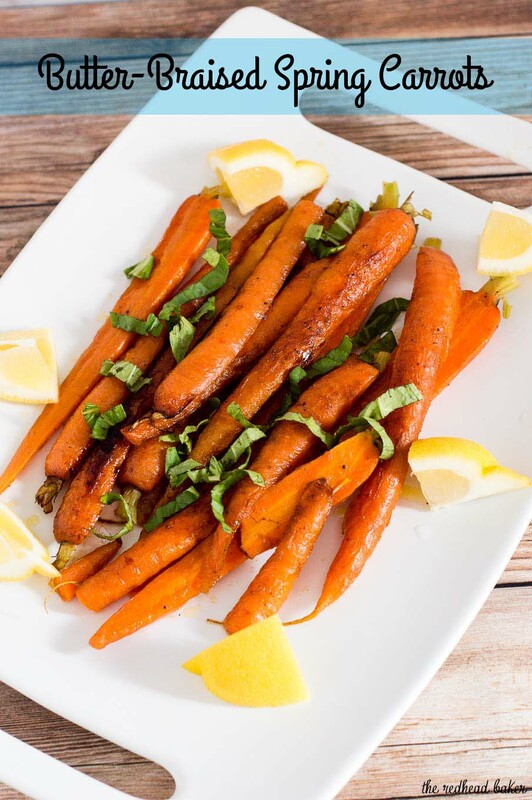 Sprinkle the carrots with a pinch of nutmeg and a splash of lemon juice, and toss to distribute. Transfer the carrots to a serving plate, and garnish with parsley, if using.